This video was posted to Youtube by My Home NC back in September 2017. Interesting conversations including with the owner but no new information. I came across this photo the other day on Pinterest; the photo appears to originate from lecontainer.blogspot.com. 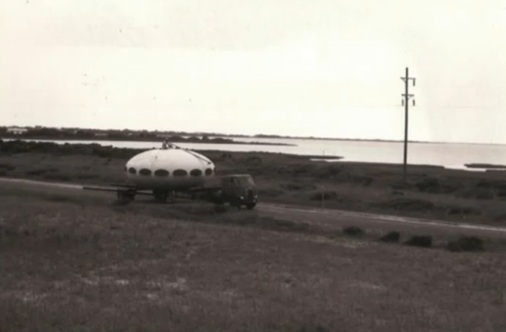 The location is not identified but I believe it is an early photo of this Futuro in its original location [check out the similarity to this photo]. 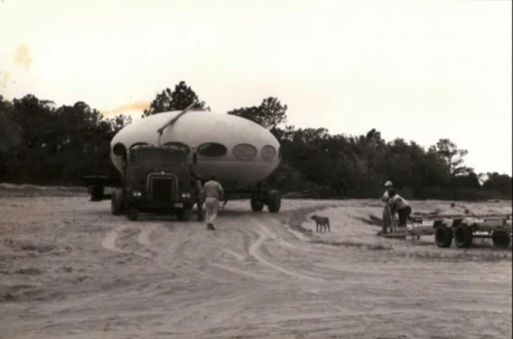 I also came across yet another video featuring this Futuro; this one was recently posted to Youtube by My Home NC. I recently came acros this video by Daniel Bray on Vimeo. "Got some of the inside work done this afternoon. It's time to fix up the ship." The "controversy" over the Frisco Futuro's future recently reached local TV with this piece being broadcast by Raleigh, North Carolina TV station WRAL. 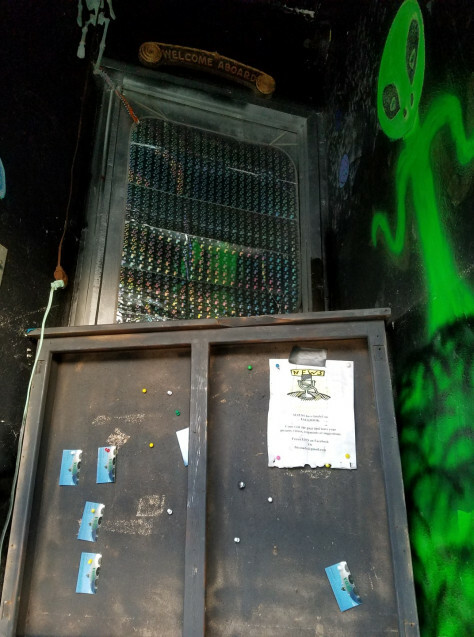 According to the County spokesperson the Futuro is not actually under any kind of threat but it cannot be occupied in any way unless it is brought up to code; until it is the entrance is supposed to be sealed. This video was posted to YouTube by ConfusedDragon on 041117. 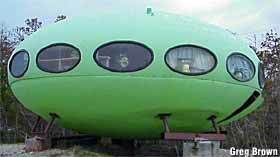 It includes a little footage of both the exterior and interior of this Futuro. 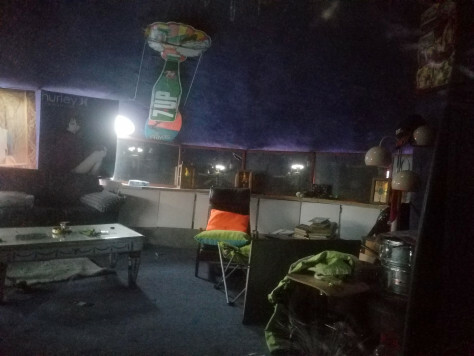 The nice set of interior shots of this Futuro seen below was taken in April 2016. My thanks to "The Foxworthy Traveling Show" for allowing me to share them here. This is perhaps one of the most photographed Futuros out there and most times the photos are very similar; that said I rather like this slightly different "dusk" shot taken by Bob 070816; thanks for sending it over Bob. 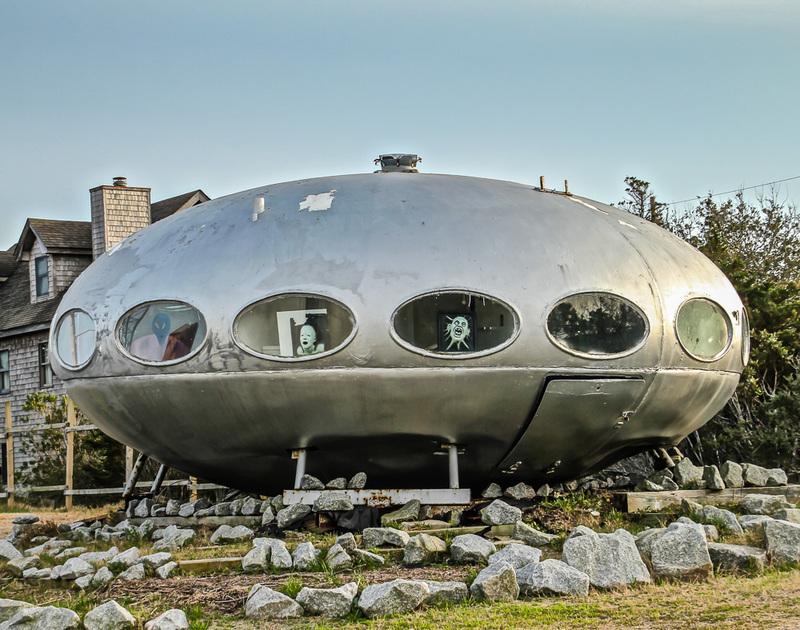 This video titled "Conversation with a Space Alien in Frisco, NC" includes words from this Futuro's owner and a rare glimpse inside the unit. My thanks to AccurateCrabLegs who shot the video and sent me a link to it. 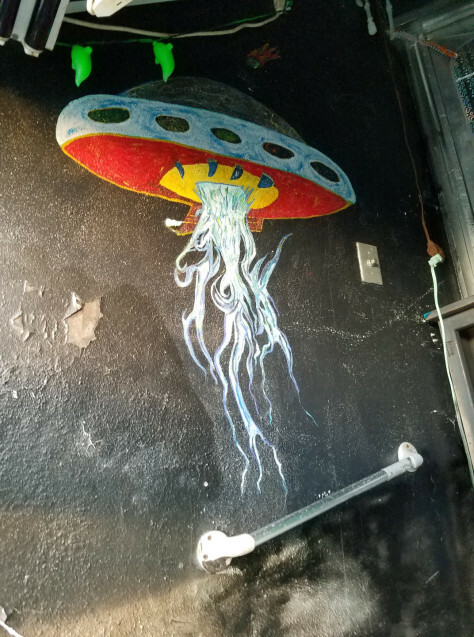 Nancy Hall has shared photos of Frisco before and while she was staying in the area recently she took this interesting photo. Taken 031416 using a zoom lens from the deck of the property Nancy was staying at the photo offers a different perspective than has been seen in prevous photos of this Futuro. Thanks for sharing Nancy. Dennis Mannion recently sent me the photo below likely taken in either 1996 or 1997, thanks Dennis. A little background on the photo can be found here. I came across the photograph below a few days ago. The original webpage on which it appears seems to be defunct but it can still be accessed using the Internet Archive Wayback Machine. 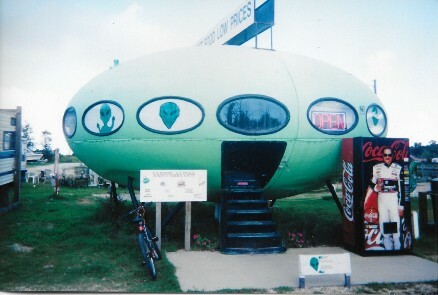 The photograph shows the Futuro during its time as a hotdog stand at the Scotch Bonnet. This video, uploaded to YouTube by Ambato1234 and filmed/edited by Kim Best presents a fascinating history of this Futuro and features interviews with the various owners over the years along with some great video footage and marvelous stills. The video is embedded below [it can also be found here on YouTube in case it does not play - there are several videos embedded on this page and some browsers seem not to like that]. Below the video are some screen captures from the video which show the Futuro at various times throughout its life. 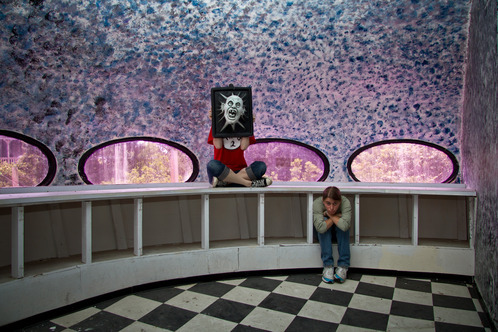 The still photography is the work of Lee and Mary Jane Russo and Ricky Jones. I would personally like to thank everyone involved for putting together such a great video and capturing the "life" of the Frisco Futuro in this wonderful video record. The Futuro as an office for "The Monitor"
It is fairly easy to determine the location of most Futuro photographs but until now I have never been sure of the location shown in the photograph below. It is from Flickr by theappraiserlady. 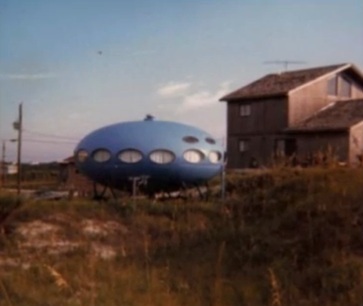 Based on the video I am now certain this is a shot of the Frisco Futuro at its original location. Compare it with the first two stills above and I think you will agree. Nancy Hall captured the following photos during a recent trip to Hatteras Island; the photos are dated from 022713 to 032613. The Futuro remains in poor condition but it does not appear, to me at least, to have deteriorated further over the last couple of years. The photos are displayed with permission; thanks Nancy. One of the original images I included on this page was a somewhat "freaky" shot by Andrew Henderson. When I contacted him to ask if my displaying one of his photographs here was OK he not only said that was fine but he also sent me a marvelous set of photos of the Frisco Futuro that he had not published online and gave me permission to display them on this site. The two images below are from this set; to see the whole set go here. 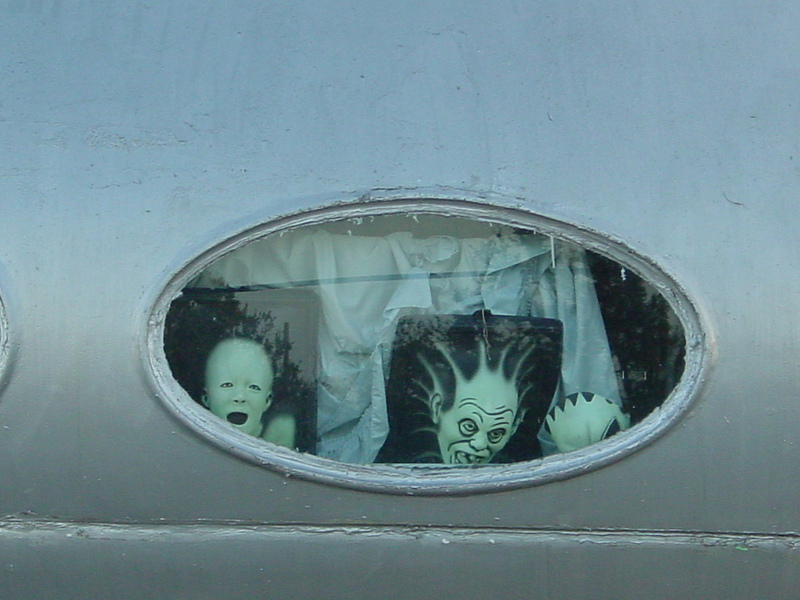 The first is another in the "freaky" class; you gotta love the aliens in the windows and I think this is a great shot. The second one is another example of the deterioration of this Futuro; even back in 2008 we see the paint deteriorating and in this shot we see what looks like huge air bubbles under the paint - it almost looked like the Futuro is wrapped in something. No matter how many ways you spin your search terms and how many search engines you use you never pick up everything when researching something online. My good friend Achim Breiling sent me a link to this article on Open Places shortly after I updated this page. For me what was particularly interesting was actually one of the comments on the post. 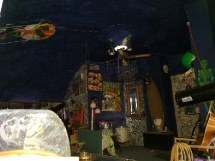 Lyndsey Keegan provided us with a description and photograph of the interior. Lyndsey describes the interior as being "Complete with bathroom, open concept living area and kitchen/bar"; Lyndsey's photo of the interior is shown below. As with the featured images above the photos below are by Runder and are displayed here under CC 2.0 license; the photos are dated 052010. 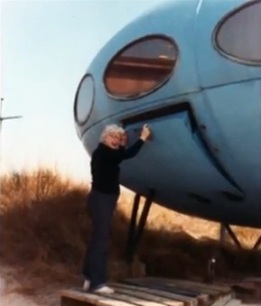 The two videos below show the Frisco Futuro House; they can also be found on YouTube here and here. 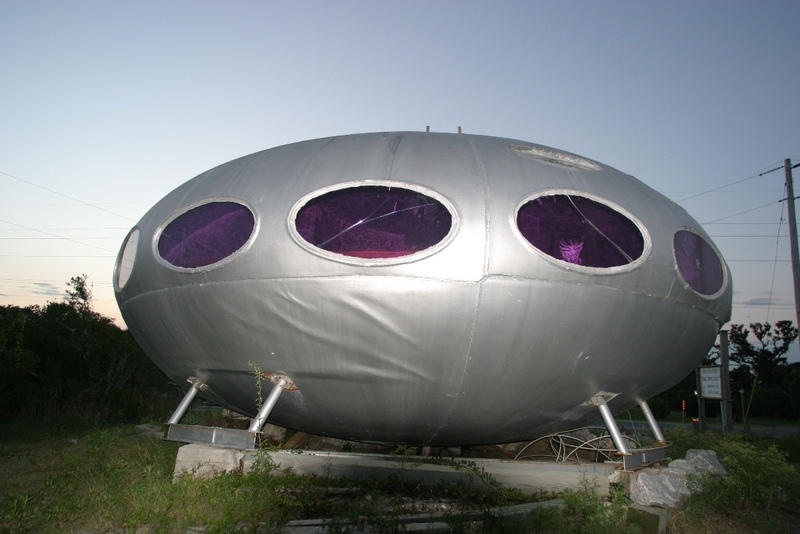 The image below, taken from a different angle than most photographs of this Futuro, shows it has an unusual window configuration. Most US Futuros have a single row of windows around the unit and the most common European configuration [for an example see the Taunusstein Futuro] includes additional windows below the main circle of windows. What we have with this Futuro is a pair of windows above the main row of windows, a configuration I have not seen on any other unit. Also worthy of note in this image is a decline in the unit's condition with clear evidence of peeling paint. This photograph was taken 100710 by stoneve. The photo below by Brian Reynolds taken 061008 also shows the unusual window configuration. 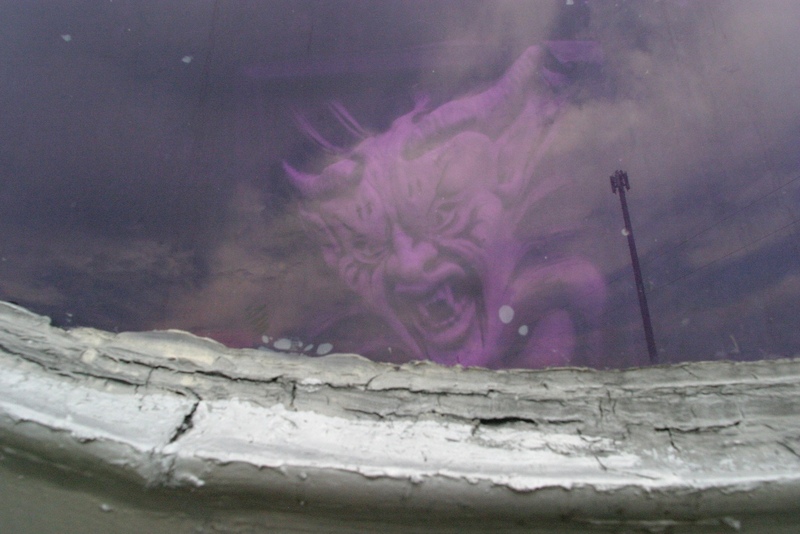 In this image, taken a couple of years prior to the stoneve photo above, the paint job appears to be in better condition and has has not yet started peeling. 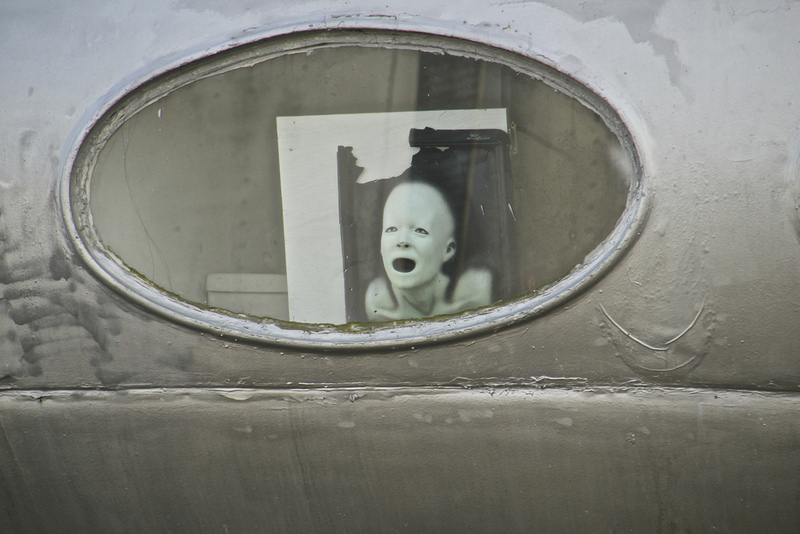 The two images below give us a detailed look at some of the "alien" masks and paraphernalia displayed in the windows of the Futuro. 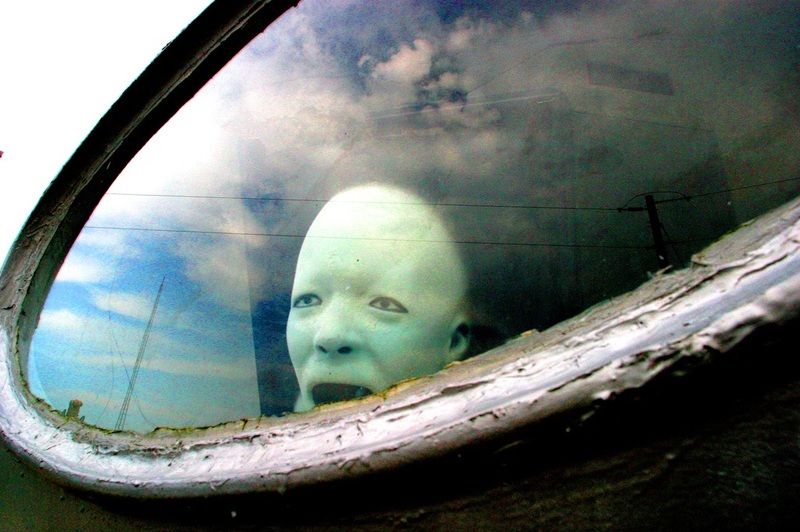 The first, taken 072508 by Andrew Henderson, is an awesome and rather freaky shot. In the comments that accompany the photo Andrew indicates that "freaky" was what he was going for; I say great job - "freaky" is definitely what the shot captured. The second shot is by juliequetel and was taken 011305. Notice that the mask on the left appears to be the one we see in Andrew Henderson's shot. 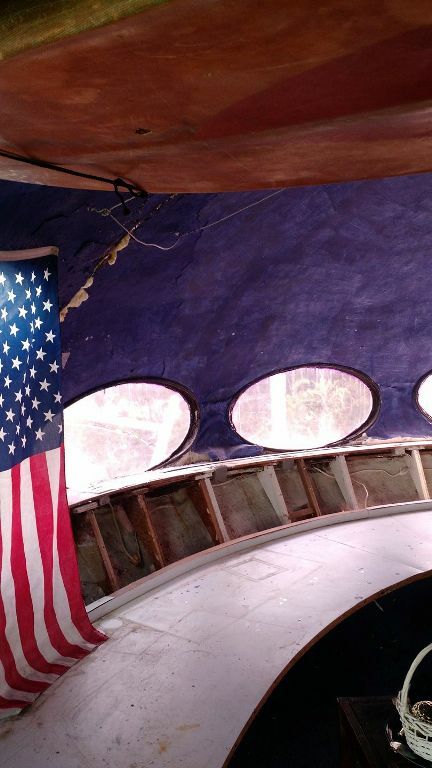 This final photo was taken 092012 by Rebekah & Matthew and it clearly shows the extent of the declining condition of the Futuro; further deterioration of the paintwork is evident and there appears to be a large hole in the shell. 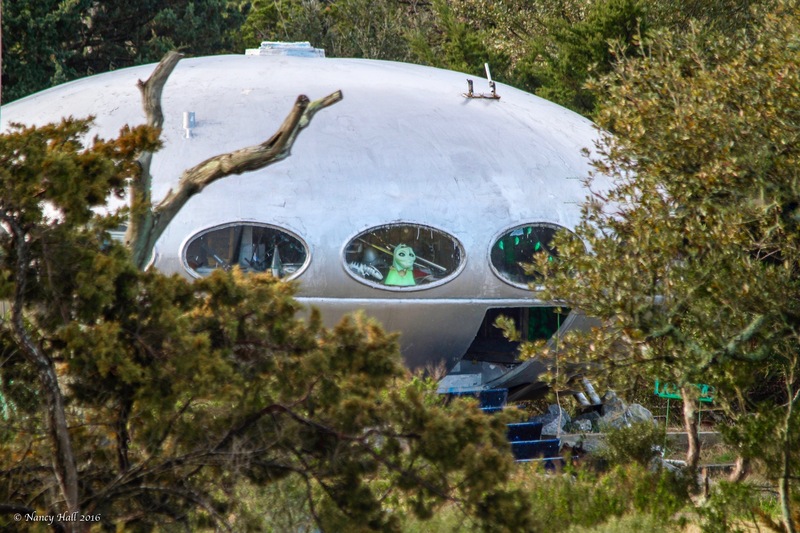 This photo also serves as the latest confirmed on site date for this Futuro. It seems that this Futuro may be running into problems with the local authorities according to this post on the Frisco UFO Facebook page. 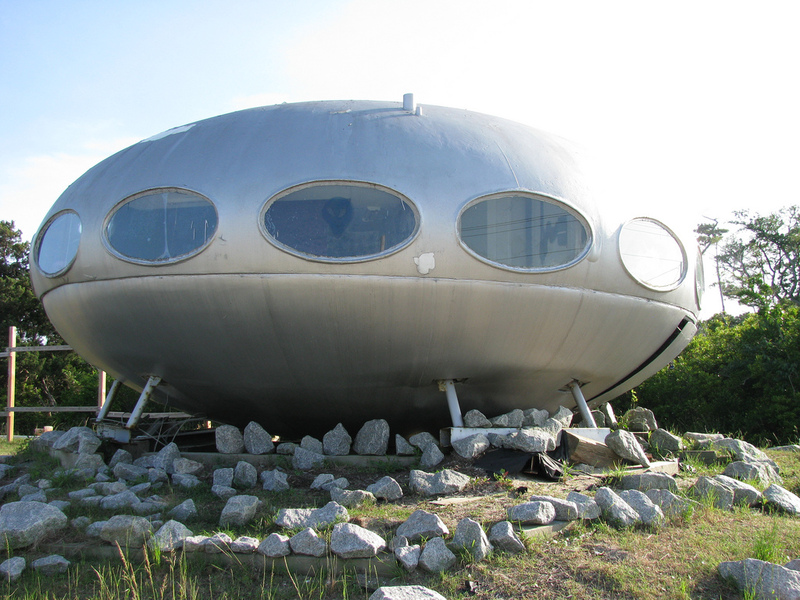 While I am not sure the local Country Commissioners will care at all about what folks out of the area think you never know so I encourage anyone who cares about the Futuro House to contact the Dare County Commissioners with a simple message "hands Off The Frisco Futuro!" Perhaps if they get inundated they will think better of whatever plans they have. There is also a petition that I invite you to sign here. 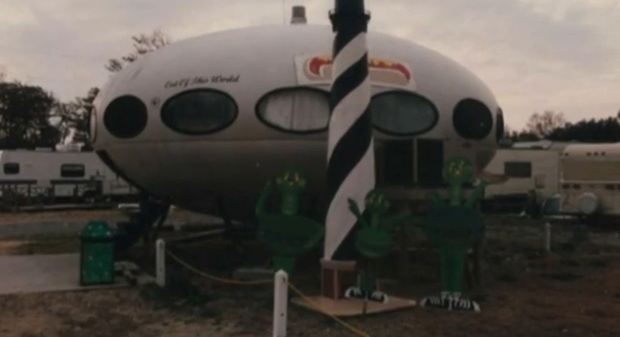 Paula Russo, daughter of Lee and Mary Jane Russo, the original owners of this Futuro, emailed me recently with a little update to some of the detailed history of this Futuro that I pulled from the video "Forty Years & Counting" and included in this section of the 041213 update to this page. The Futuro delivery crew dropped the Futuro on the foundation not in the street. 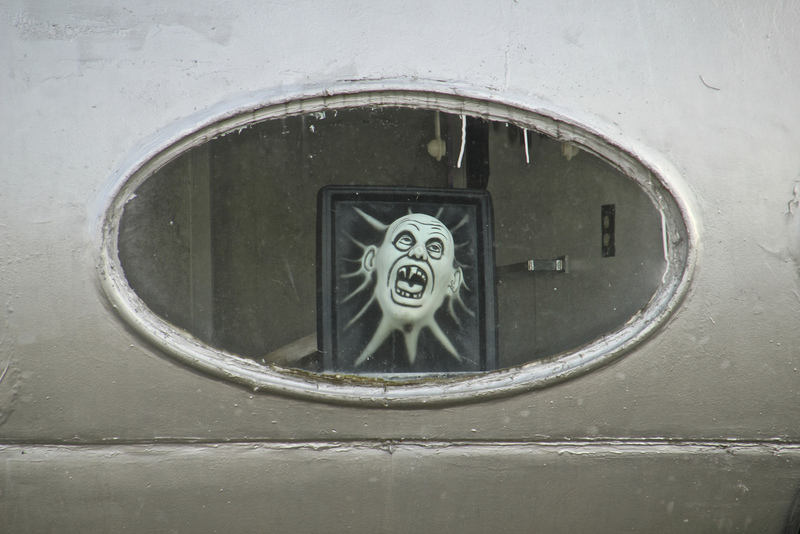 There was a huge buckle in the fiberglass to the right of the door and, as delivered, there was no wiring, no plumbing, no kitchen and no painting. Paula's father was a doctor and a good many of his former patients had become friends over the years and many of them were part of a crew of about 10 tradesmen he brought together to fix up the Futuro; the process took around two weeks. At the time the beach was around 50 yards wide and there were only three houses on the road; there was rarely anyone on the beach and the island was still relatively isolated. 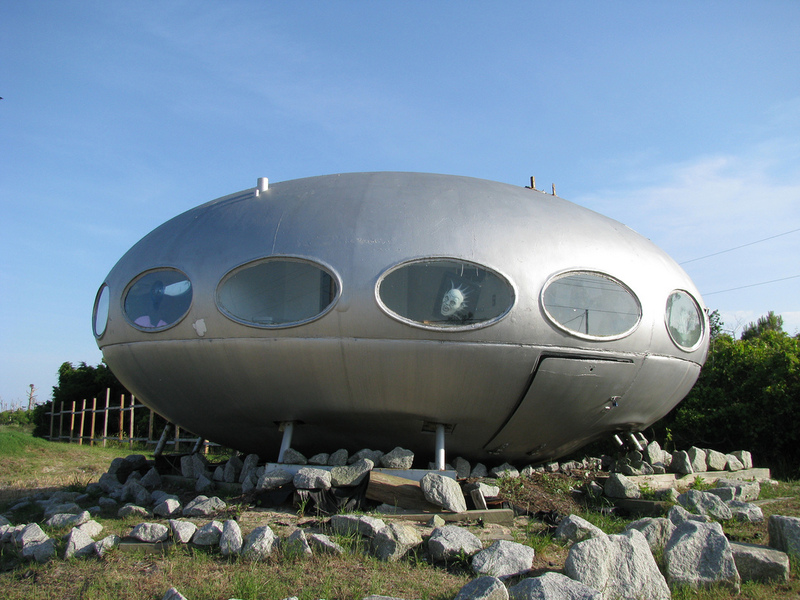 Paula tells me that once fixed up she spent a great deal of time in the Futuro which she considered [her words] "the most intensely cool house in the world". 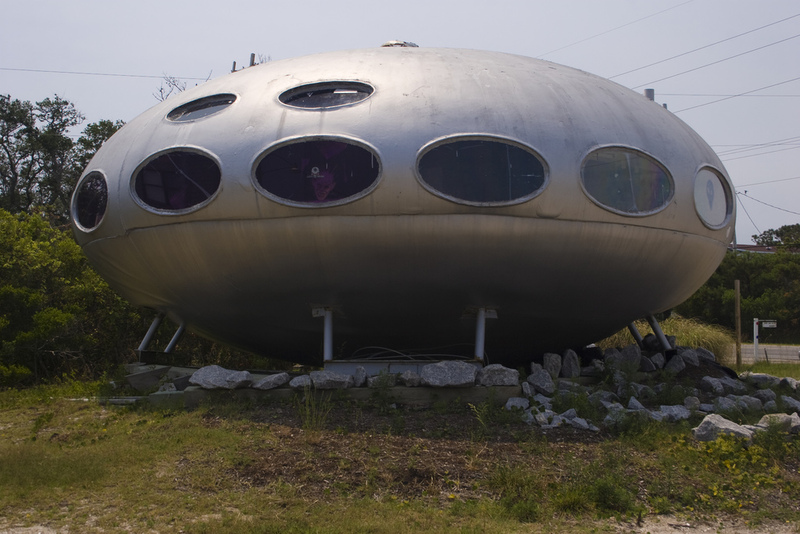 Paula added that rain would make a tremendous racket on the roof and the Futuro would sometimes shake a little in windy conditions and that she and her family would always stay in a local hotel during hurricanes telling me that "there was no way we were staying in that house". 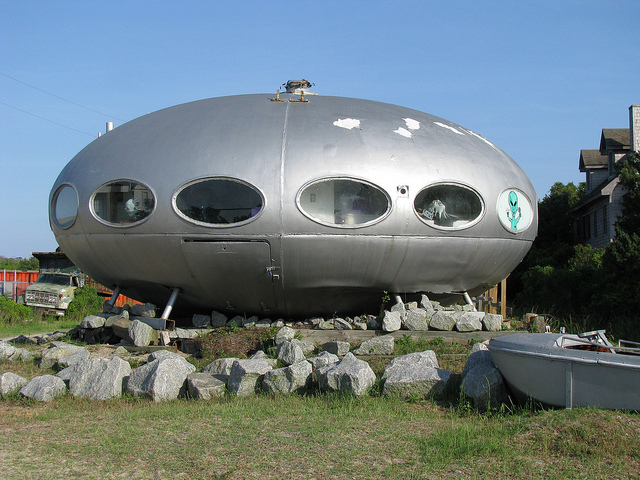 That said the Futuro clearly survived the hurricanes as it is alive and well to this day. Paula, many thanks for sharing your recollections; you certainly have a far better memory that I ever thought about having. Dennis Mannion recently sent me this photo [thanks Dennis] taken by his son Jake. Dennis tells me he and his family vacationed in Frisco or Hatteras many times starting in 1988. 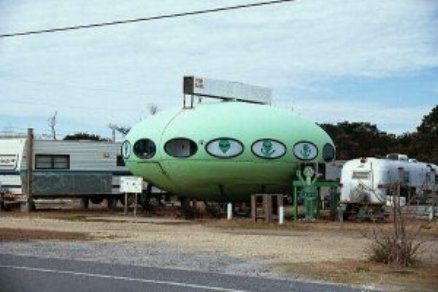 On that first vacation the Futuro was in the Scotch Bonnet parking lot; it was a "food spot" and painted silver at the time. "In subsequent years the house had been moved to the other side of the road (still functioning, I think), and then moved around a few 100 yards or so but eventually not functioning as anything. Just a landmark to look for." This is again in accord with previously documented history [which has the Futuro leaving the Scotch Bonnet between Sept 1999 and Sept 2000] though it is interesting to note in this photo that the business appears to have been named "Cosmic Cones and Carry Out" which is different to the previously documented name "The Footlong Out Of This World Hot Dog Stand". The other day I came across an archived webpage while searching the Internet Archive Wayback Machine which included the photograph at left; a Futuro photograph I had never seen before. The original webpage seems to have gone but the archived page can be accessed here. Initially I did not recognize the location or the Futuro but there were things about the photograph that "rang a bell" and after a little searching I realized it was a photograph of the Frisco Futuro during its time at the Scotch Bonnet. The color of the Futuro is different from other photos of the location but we know that the Frisco Futuro was painted green at one point [see this photo]. In the end I had no doubt about the location based on the similarity of the photo to this photo of the Futuro at the Scotch Bonnet location and on the fact that the "alien art" seen in the windows is identical to that seen in photos of the Frisco Futuro such as this one. I have no intention of going over my reasoning again, that can be found below, but based on all the evidence I believe that this Futuro was moved from the Scotch Bonnet location to Frisco sometime in the period between Sept 1999 and Sept 2000 and that at the time of the move it was finished in green. This "new" photograph is most likely to have been taken sometime not too long before the move to Frisco. The archived webpage only indicates it was published 2/6 with no indication of the year; the archive capture of the webpage was from 2003 but certainly the photo was not that late and the webpage was clearly published some years before the archive capture. I came across a video, titled "Forty Years & Counting", a little while ago but then lost track of the url. Nancy Hall recently sent me a link; thanks Nancy. 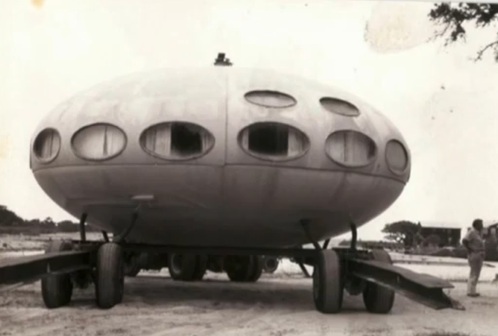 The video offers us a fascinating history of this Futuro and features interviews with the various owners over the years along with some great video footage and marvelous stills. You can find the video at left. Though obviously the video was not made for "little old me" I would like to extend my thanks to all involved for creating such a fascinating and fact filled look at the life of the Frisco Futuro; as a result the history of the Frisco Futuro is now as well documented as almost any Futuro out there. The video clears up many of the questions about the history of the Frisco Futuro. It does actually confirm much of what I had listed previously but it also disproves some of the reports and rumor about the unit; in particular it appears that the reports in a discussion thread on OBX Connection [referenced in the original information below] that the first use of the Futuro was in Avon as a real estate office and that there may have been two units known as the "Double Bubble" are not true. 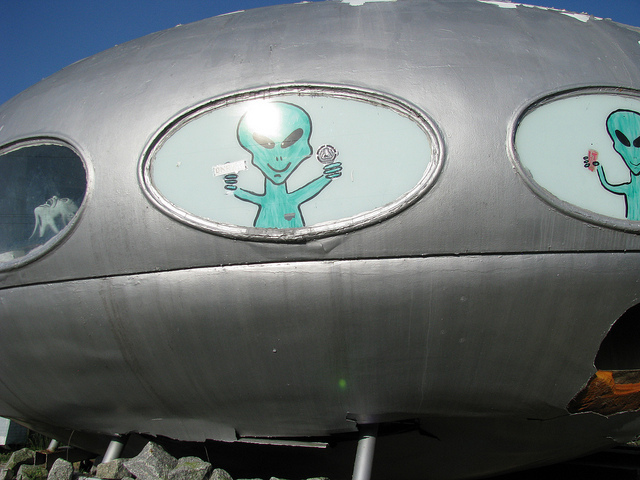 Of course that leaves us wondering whether there was another Futuro [or two] "back in the day". 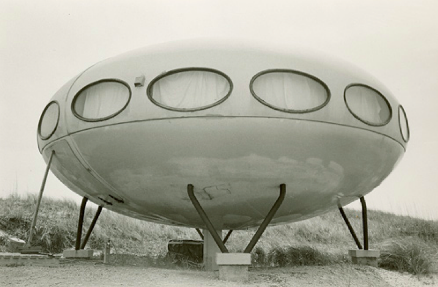 So what of the history of the Frisco Futuro? What does the video tell us? 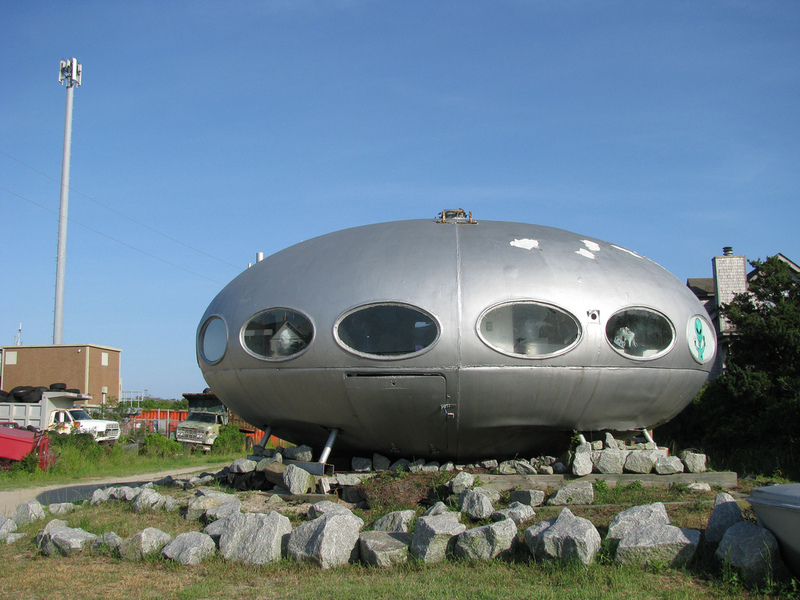 The original owners of the Futuro were Dr. Lee & Mary Jane Russo. The Russo's were on vacation in the area in 1970 when they came across a plot of land they decided to purchase. 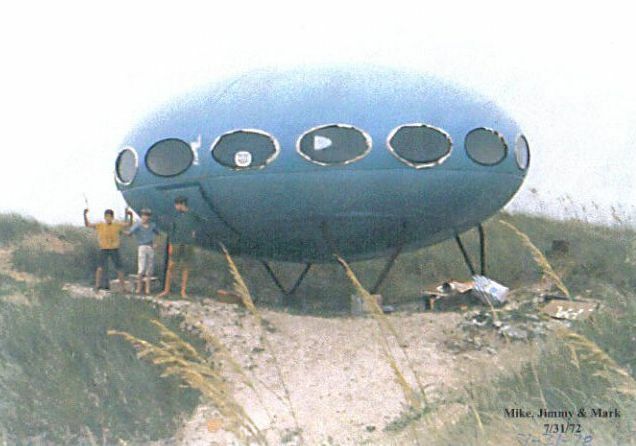 They needed to find a house to put on the land and they saw The Futuro House in the "The Last Whole Earth Catalog" and decided that would fit the bill. 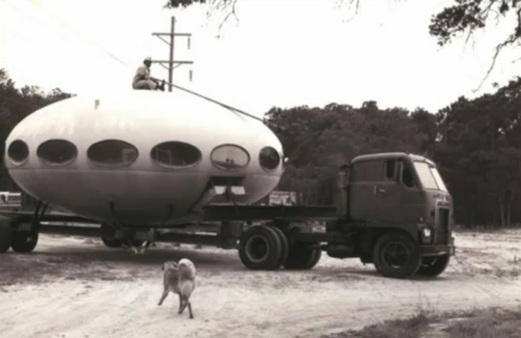 Their Futuro was transported from New Jersey in two halves on a flatbed truck in 1972. Apparently the drivers simply dropped the Futuro off in the street and left all of the interior fixtures and fittings along side. 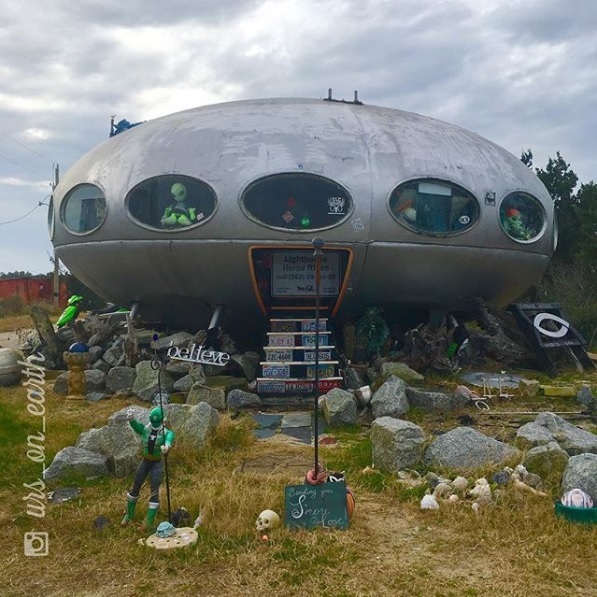 A local builder helped assemble the Futuro [at one point dropping it from a crane] and then later some dozen or so friends and family spent two weeks helping the Russo's get everything installed inside. 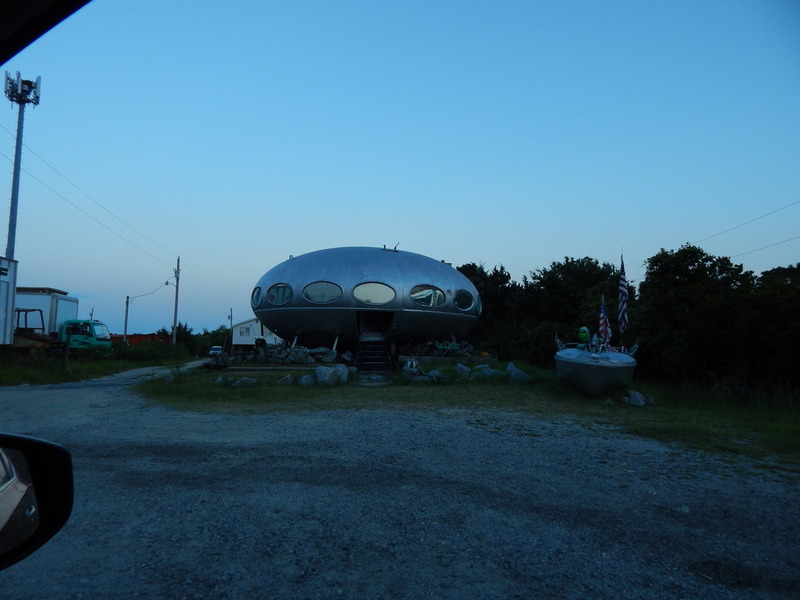 The Russo's used the Futuro as a holiday home and "escape" from Baltimore until 1983. By then the family had "outgrown" the Futuro and the Russo's donated the Futuro to the local volunteer fire department following their last night in the Futuro on 031983. The fire department was originally going to burn the Futuro and use it as part of a training exercise but instead it was raffled off and moved to Frisco. Despite the wealth of information in the video there are still some facts that are unclear. The Futuro was moved to Frisco in 1983; John O'Brien of the Scotch Bonnet tells us that his parents purchased the Futuro in the late 80's. It is unclear exactly where the Futuro was located between 1983 and the late 80's. 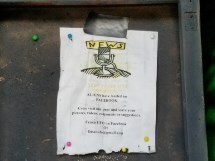 What we do know is that once the Futuro left the Russo's it was used by the Boy Scouts for a while and also served as the office for a local publication, The Monitor. Whether one or both of these uses was prior to the purchase by the O'Brien's is unclear. Following the O'Brien's purchase of the unit in the late 80's it was rented out for a while, used for two summers as accommodation by John O'Brien and his brother and spent some time as the Scotch Bonnet Campground office. The last use of the unit on the Scotch Bonnet site was as "The Footlong Out Of This World Hot Dog Stand." The video does not indicate when current owner James Bagwell purchased the Futuro and moved it to its current location but based on the evidence of Google maps and other factors [see original information below] this is likely to have been sometime in the twelve months following Hurricane Dennis [sometime Sept 1999 to Sept 2000]. 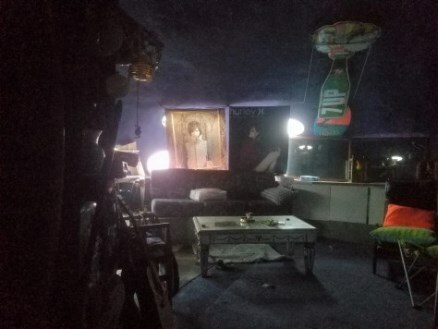 The Futuro is not your typical building, it probably does not appeal to everyone and you would perhaps be forgiven for thinking a Futuro owner night just have to be a little wild or eccentric. The video certainly shows us that James Bagwell has character; I particularly like the evident joy he seems to get from annoying the County Government. The book North Carolina Curiosities, 4th (Curiosities Series) includes a two page article on the Frisco Futuro on pages 248-249. 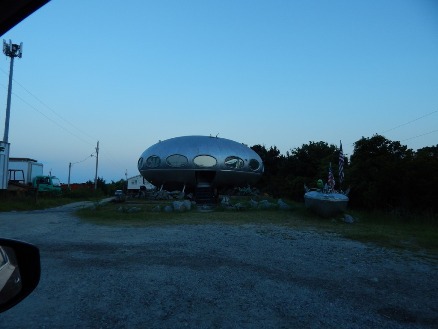 We are told that the Futuro first arrived in the area in 1970 and has served many purposes over the years since including serving as an oceanfront cottage, a Boy Scout meeting place, a magazine office, a hotdog stand and a knickknack shop. You can read a part of the article on Google Books. 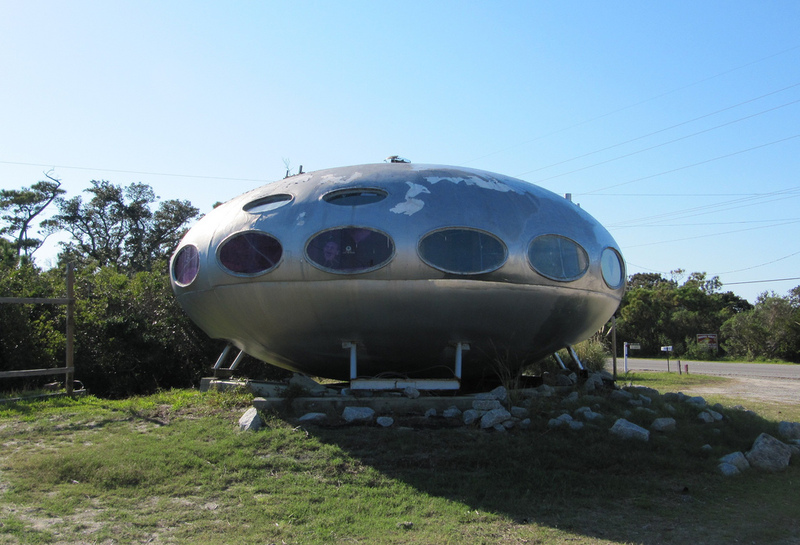 The Dare County website Tax Info [Search for parcel number 014961001] section tells us that the current owner of the Futuro is Bagwell Realty, Frisco, LLC and that they have owned the Futuro since at least 2002. There is a photo of the Futuro dated October 2010 on the county website here. 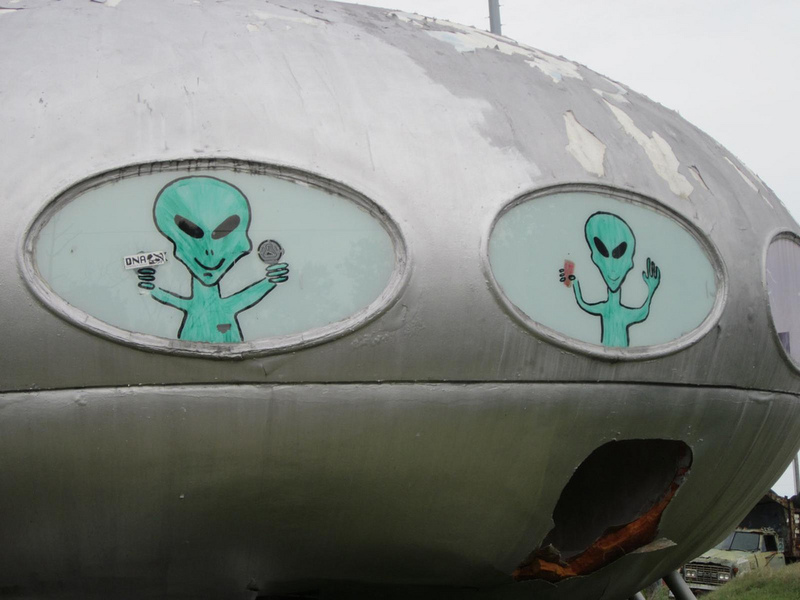 "The space ship was first located in Avon. It was the First Office of Outer Beaches Realty, then owned by Anne and Wally Beckham. I don't remember the exact year but it was in the 70s 1974 - 78. When they built the new office that now houses a art gallery (next to subway in Avon) they sold it to Scotch Bonnet and it has been used for many things in its life here on the Outer Banks." 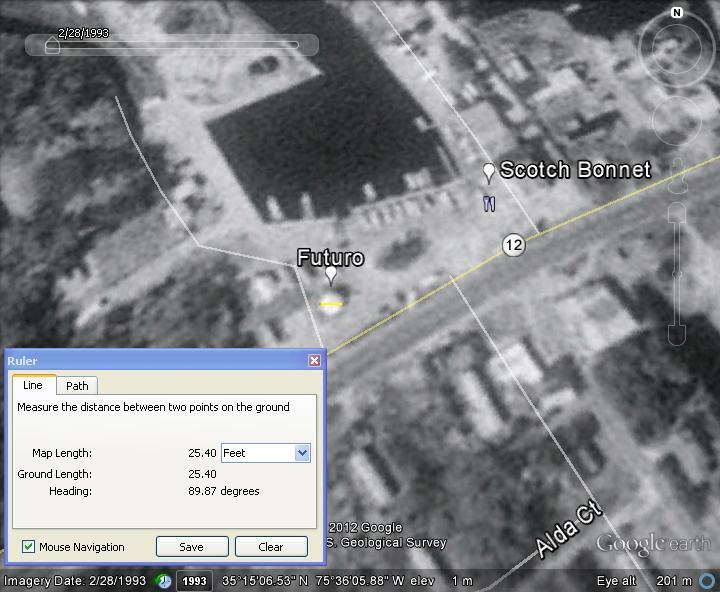 A few minutes with Google Earth identified the previous location as being The Scotch Bonnet, North Carolina 12, Frisco, NC, USA [35°15'6.46"N 75°36'6.27"W]. 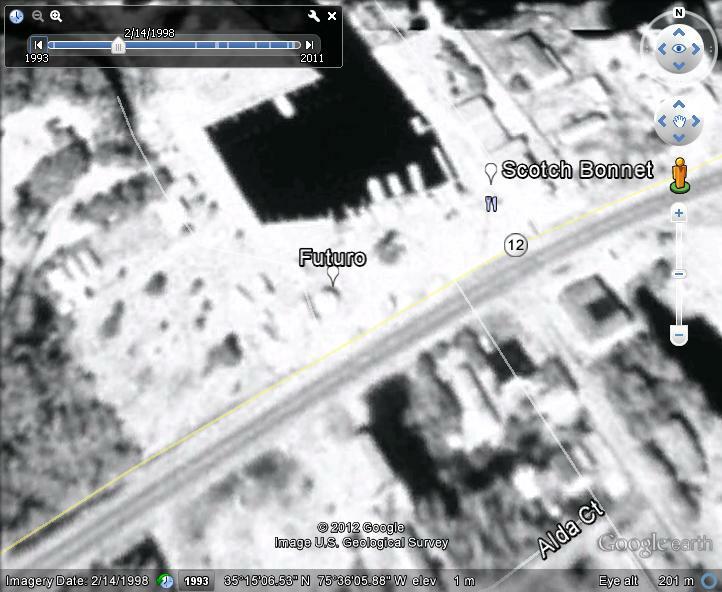 The image below is a screenshot of the Futuro from Google Earth using imagery dated 021498; earlier imagery in Google Earth places the unit at this location as early as 022893 [second screenshot below]. The Futuro is actually much clearer in the earlier imagery but it is still evident in the 1998 imagery. Since the Dare County tax info suggests the current owners have owned the unit since at least 2002 is seems likely [though not definite] that the move from The Scotch Bonnet to the current location took place between 1998 and 2002. "When it was first brought it here as the Outer Beaches Office there were TWO of them and it was called The Double Bubble. They sure got a lot of attention. I don't know what happened to the other one but if I run into anne I will ask her. I never saw it on the Island . They were really nice had a big deck that connected the two and they had offices for the Realtors." This is the only mention I have ever come across of there at one time being two Futuros in the Outer Banks. If anyone has any information about this or perhaps even an old photo please let me know. A photograph on the website silverdragon.com is accompanied by another reference to time as a hot dog stand only in this case it also sold ice cream. 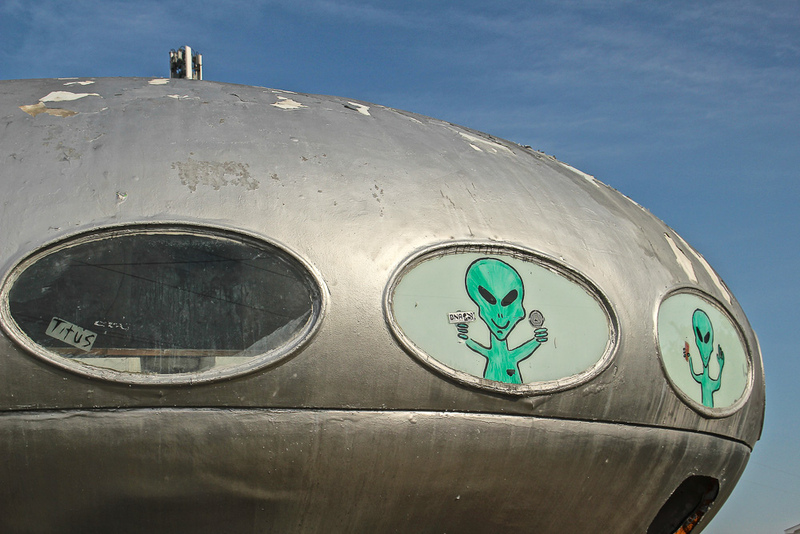 In an article on the Futuro on Flatrock we are told the Futuro operated as an ice cream stand at one time and that now [not sure when "now" was as the article is not dated] the owner occasionally opens it and sells retro "space age" items. Interestingly the photo that accompanies this article shows the Futuro without all of the rocks around it that we see in almost all of the photos; perhaps taken when the unit had not been long on this site? 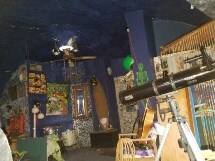 A mygola.com article recounts a real estate office, a vacation home and a flea market as roles for the unit. 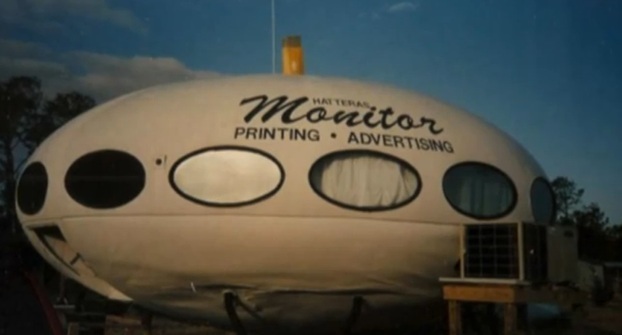 On a page titled "Topside Hatteras" on DiveHatteras.com we find another reference to the Futuro being used as a magazine office; the Hatteras Monitor. In addition we read that "supposedly" someone lived in the unit at one time. 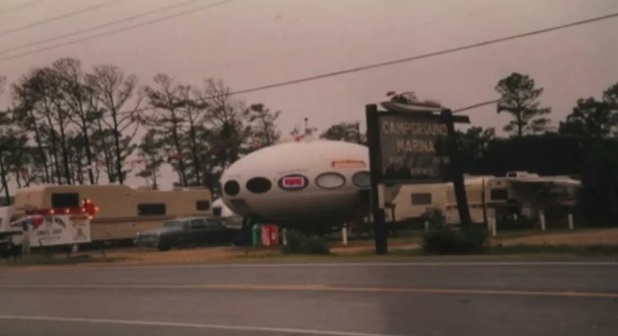 A 2008 flyer published by the North Carolina Museum Of History [download] titled "You Can't Miss It: Roadside Fun" indicates that the Futuro was once a diner. Various posts on RoadsideAmerica.com also reference time spent by the Futuro as a restaurant as well as a flea market [in October 2003]. As is the case with many of the Futuros it is hard to be certain about this Futuros history but there is a lot of similarity between the various reports; what someone calls a hotdog stand another might consider a restaurant and yet another might describe it as a hotdog and ice cream stand for example. 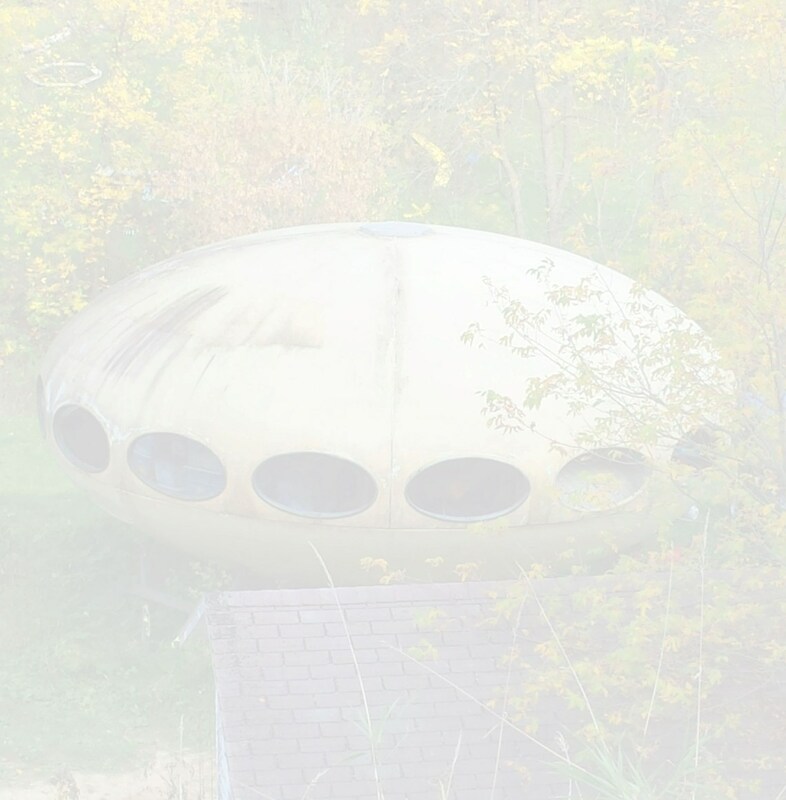 Reading all of the comments and references it seems to me most likely that the Futuro served as a real estate office for Outer Beaches Realty in Avon, as a restaurant/hotdog stand/diner while at The Scotch Bonnet and subsequently perhaps as a sometimes open, flea market like business. On RoadsideAmerica.com Greg Brown posted the photo to the right showing the Futuro painted a light green; as best I can tell from various photos and the [albeit not entirely clear] history of the unit it seems like the Futuro was repainted in its current metallic silver sometime after being moved to it's current location - probably soon after the move. Eric Johnson reports the unit as a restaurant a few months before a post dated 080298 and at that time the Futuro was green. Greg Brown comments on 042900 that the unit was no longer a restaurant; it does not seem to be a stretch to infer that it stopped being a restaurant at the time it moved to its current location - in theory narrowing the possible window for that move to between 021498 [confirmed at The Scotch Bonnet by Google Earth] and 092300 when Greg Brown comments on its new paint job and its being surrounded by landscaping timbers and pine bark [which sounds like the current location based on various photographs]. A comment on a Mike Lynaugh photograph on Flickr sheds some light on a possible reason [and perhaps narrows the time window again] for the move from The Scotch Bonnet to the current location. JoshNonny tells us that the Futuro was damaged during hurricane Dennis and then went out of business; that might explain why it ceased to be a restaurant and why it was then moved. Dennis made landfall near Harker's Island, North Carolina on 090599 after having been stalled off the North Carolina coast for several days. 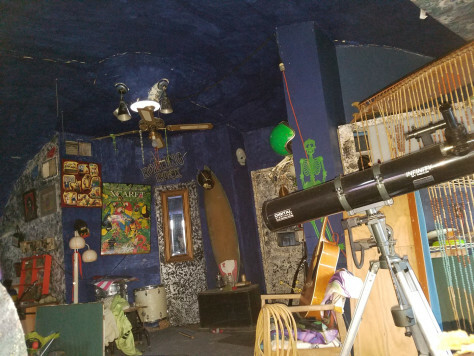 It is quite possible then that following the hurricane the restaurant closed and the Futuro was moved and that would place the move sometime after September 1999. If we add this hypothesis to the theory above that the move must have happened prior to 092300 we are left with the move having taken place sometime in the twelve months following hurricane Dennis. This photograph by urs_on_earth taken 030219.